Four unanswered goals in the first period and a hat-trick from Patrick Dwyer helped the title chasing Belfast Giants to a 2-7 victory over the Genting Casino Coventry Blaze at the Skydome Arena. The three from former NHLer Dwyer were timed at 5.41, 9.16 and 19.14 (shorthanded) split by a strike from Brit Jonathan Boxill (13.32). 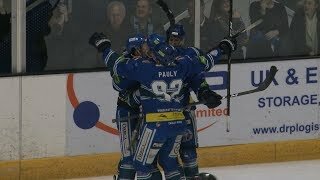 After scoring, at 18.33, Boxill was to drop the gloves with Blaze’s player/assistant coach Kevin Noble following a huge hit by the Coventry defenceman. In addition to the standard 5 minutes for fighting, the Giants player was also to receive a 2+10 instigator penalty on the play. Jonathan Ferland made it 0-5 at 21.17 as British back-up Jordan Hedley replaced Canadian Matt Hackett in the Blaze goal. Despite the tilted score-line, Coventry had made chances, and that trend continued, with Alex Nikiforuk finally beating Tyler Beskorowany for the first time at 36.53. Ben Lake on a tipped shot from Justin Hache made it a 2-5 on 41.05, and with a powerplay chance shortly after, Blaze Head Coach Danny Stewart decided to pull Hedley in favour of a 6-on-4 -man advantage. It was though Belfast who were to score into the empty net (55.06) and all but end the game through Darcy Murphy with a third assist of the night going to Blair Riley. Great Britain’s all-time leading goal scorer, Colin Shields, who recently announced his retirement at the end of the current season, wrapped up the scoring (55.31) for a final score of 2-7. The result means Blaze remain one point ahead of Manchester just inside the playoff places with the two sides meeting in Altrincham on Saturday. 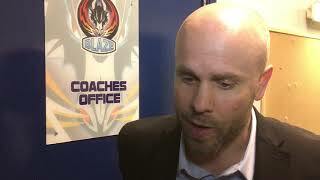 A regulation win would see Coventry qualify for the post-season playoff competition, whilst depending on what happens when Manchester face Milton Keynes on Friday, a defeat could mean the end of Blaze’s season.